Here's a look at a gorgeous coral-coordinated eyeshadow quad by Maybelline called Coral Oasis. I really enjoyed using these shades over the summer, and felt they complimented many bright and neutral outfits. This quad is a part of the permanent Eyestudio line and should be pretty easy to find in your local drugstore! I have to say, I'm not a fan of Maybelline's single eyeshadows, so I was hesitant to try this quad when this line first became available. I'm so happy I caved in and picked up this palette because it did not disappoint. 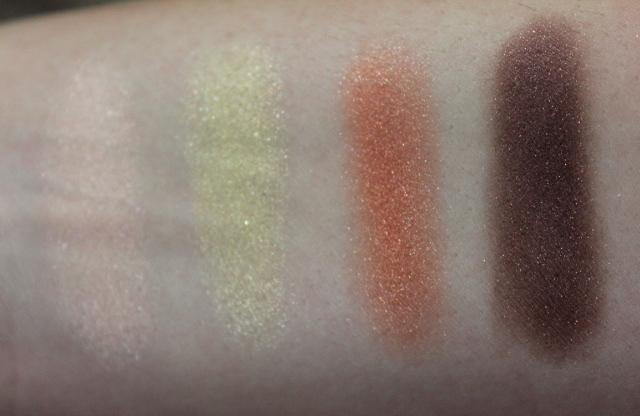 The shadows are smooth, blend-able, and have great color and shimmer pay-off. If you're more of a matte gal (or guy), steer clear of this palette (and most of the quads in this line) as all these shades are highly shimmery. Even though I would have preferred one or two matte shades (like the highlight and crease color, for example,) I think the color coordination of this palette is spot-on. When worn on a summer day, the result if a very reflective and beautiful eye-look. The quad comes with a champagne shade with a peach undertone, a yellow-gold, vibrant coral/peach, and a deep mahogany brown. All seem to have a fine gold shimmer to them. I wore this palette paired with the Maybelline Eyestudio Color Tattoo cream shadow in Fierce & Tangy (swatch here) for a true orange eye look. These quads retail for around $7-$10 depending on where you buy them and can be found at most drugstores as they are part of the permanent line. Do you have any favorite quads by Maybelline?